When I was youngster of 18 (who looked 13) I was fortunate to work at a splendid book and comic emporium in Falls Church, Virginia. 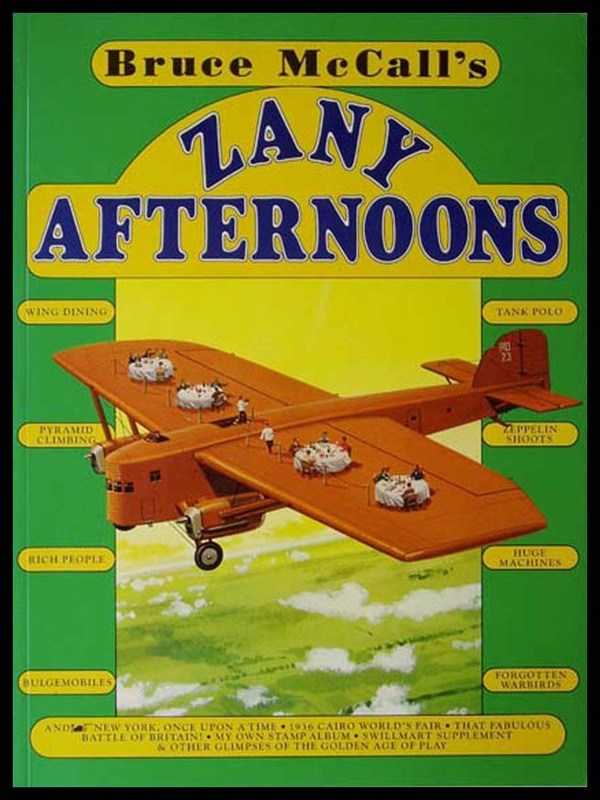 One day I was filing new books and I came across a tome I’d never seen before, and certainly couldn’t afford – Bruce McCall’s Zany Afternoons. I was too young to have encountered the articles there collected in their original homes in the National Lampoon and Esquire. And somehow I missed him among the articles in Dad’s Playboys. 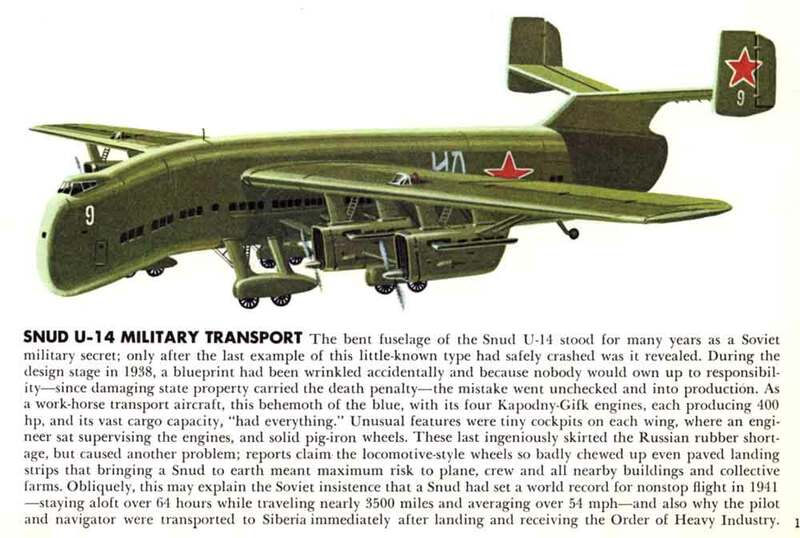 But this compendium was a cavalcade of hilarious drawings. 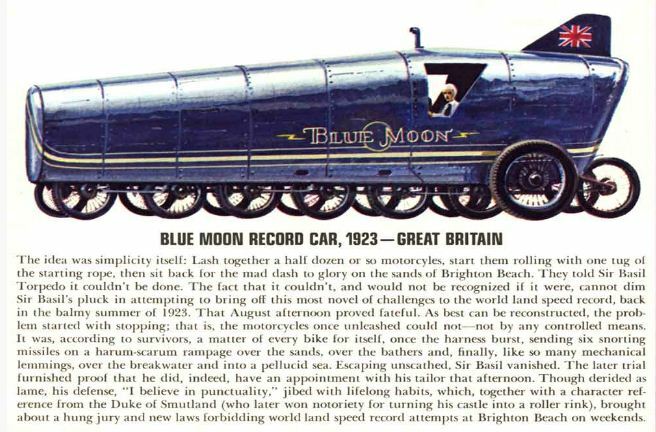 And better still, outrageous captions and accompanying text pieces that torpedoed the gloss and smarm of advertising. It was almost as though The New Yorker had tried it’s hand at redesigning the beloved Wacky Packs of my youth. In Major Howdy Bixby’s Album of Forgotten Warbirds the stoic Brit’s Humbley-Pudge Gallipoli Heavyish Bomber, and the fiendish Germans’ Dinkel GX Kleinefeuerwerkswaffe or”Little Fireworks Weapon” fought the hapless Italians’ Caproni-Moroni for the honor of dumbest warplane. The RMS Tyrranic (The Biggest Thing in All the World) featured in its glowing brochure a photo labelled “Mutton is taken. X Deck”. Page after page, the book was a nonstop exercise in fun. The author had created a surreal catalogue of all my boyhood enthusiasms and put them together in a way I never could. It took me many years (and a good friend in hinterlands so remote she found one on still the shelves) to get a copy of my own. I still count it as a favorite. Later still, Barnes and Noble put out a hardcover reprint of the paperback original. They were gone from the shelves before I knew to look (and many assume them the 1st edition. After all what lunatic would publish the hardback second?). 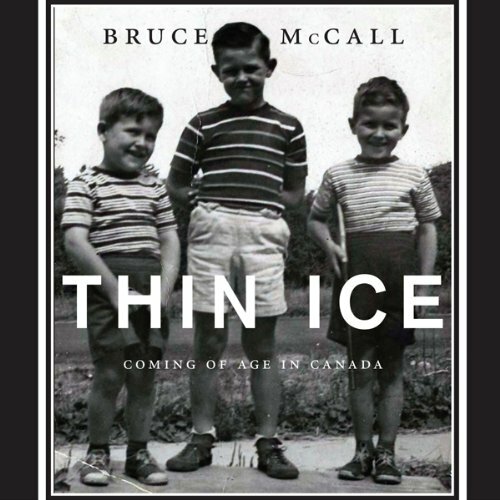 On my recent trip east, I was presented with Thin Ice, author Bruce McCall’s autobiography. I had barely begun his tale of Canadian dysfunction and wishful patricide when I got word that my own father had, after a slow and horrific decline, finally died. So, the long-awaited reading became an unbidden exercise in comparing and contrasting. 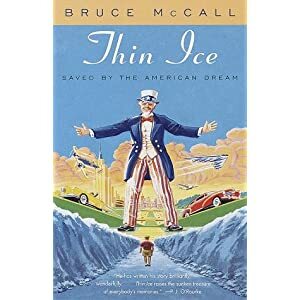 I’ve long held that McCall is a better author than artist, and Thin Ice proves that, in spades. Again and again I’ve seen writers and artists goaded into creative work, into creating their own worlds where they might know a minutes respite from their daily strife, and where the rules finally made sense. When I suggested to my friends at Periscope Studios that a colleague seemed to be making comics for this very reason, they all seemed to stare and sadly nod their heads. OF COURSE he does. It seems that most everyone starts out that way – however much some of us might pretend otherwise. I was lucky enough to have a good parents (and an intervening fairy Godmother [I cannot recommend such a Godmother highly enough. If you find one, please let me know]) and I seem to have accordingly exorcised most of my adolescent drama. Sadly, McCall’s father T.C. was a tyrant, and his exorcism will never be complete. But as I reread Zany Afternoons today and marveled again at the cleverness and creativity forged in the furnace of his frosty Canadian Hell, I wondered which parts of his ghastly childhood I’d have spared him if I could. Immediately upon leaving Portland (but not so immediately that turning around made sense) we discovered that we had completely forgotten to bring our ancient camera. This error would have been bad enough if we were bound for an ordinary vacation, but for a short trip to gather as many useful reference photos as possible? Not good. Thanks to the miracle of the iPad and the internet, it all turned out OK. As Lee drove through the rainy Columbia Gorge, Venetia called up a fantastic camera shop in Spokane (see the map of our 6 day trip above) and after a long discussion with their knowledgeable staff, we decided on the new Canon Powershot S100 that had been championed by Kyle Cassidy and Roger 23. We had been debating buying a new camera for some time, but had not made the leap while Lee’s was working feverishly to get the revised Doom That Came to Atlantic City box prepped for printing. Venetia loves the new camera and took over 1000 photographs this trip while Lee art directed as usual. Her pictures of scenes, palettes and above all texture will be integrated into Lee’s work, and as a little aside, we get to share a smattering of our trip photos with you here. Spokane is a beautiful and interesting place. Lee was there in ’74 for the World’s Fair and the strange and wonderful architecture from that time makes the river park downtown a delightful place to explore. “YOUR CAR IS YOUR CAGE!” exclaimed the sign for a roadside drive-through-bear-park (no, really). That warning served as our motto for the rest of our trip. It might serve the people of LA or Dallas metaphorically, but here it meant literal business. The Going-to-the-Sun Road had opened just days before our visit and Andrea warned us to bring warm clothing. As it turned out, it was a mere 45 degrees (Venetia found that temperature cozy in Montana but positively frigid in more-humid Portland. Lee put on a sweater.) The fog, however, was out in full force. We learned that the road had been closed shortly after we began our journey upwards, and we whole-heartedly agreed with the park rangers’ decision considering the massive fog bank concealing the road the entire drive back down the mountain. Going-to-the-Sun Road was remarkable. Picture cannot do justice to the sheer cliffs and awesome drops to the valley below. It was a harrowing ride up to the top, made all the more nerve-racking by the construction work repairing the damaged spots where the road had crumbled off the cliff face, and the oncoming buses. Upon reaching the level of giant snow banks we scrambled out of the car and raced around on the snow for a time, observing the mountaineers setting out across the great fields of snow. At the highest point obtainable by the road, we could glimpse through the fog the still higher glacial peaks. Andrea was willing and able to stop regularly so that we might better take in the sights and take pictures and the Park roads were happy to oblige us with reliable turn-outs to pull over on and park while we made awed sounds and the camera shutters clicked away. The construction allowed stops that most tourists would never get, and the attendant pictures were excellent. It’s astonishing to imagine the rugged designers and engineers of our park roads in action. How very fortunate are we to treat these luxuries as simple facts of life? Not just the facts on the ground, but the facts suspended on cliff faces and over boiling geysers? The second half of the day was considerably more rainy and cold than the first, but we still saw many spectacular sights. A mother moose was foraging by the side of the road, and we passed by a disgruntled cow that had been separated from her herd mates. Driving alongside the park we passed many people running in the Waterton Glacier Relay. We admired these brave and fit people from the warmth of our car as we passed by them. Later we stopped at “Goat Lick”, and enjoyed the spectacle of Mountain Goats enjoying the vertiginous salt cliffs. Apparently they are dependably visible and we saw 4 goats spread over a pretty vast distance. Still later, at the nearly ice-cold water met the warm air at twilight, the river steamed and swirled. It was lovely, if more than a touch foreboding. After our final glimpse of Glacier and indulging in more ice cream in Whitefish, we successfully navigated a brilliant thunderstorm on our way home and rewarded ourselves in a jolly, tear-inducing game of Cards Against Humanity. Lee won the hard-fought game with an epic poem on the gritty grandeur of the human adventure. On Sunday we left Kalispell and Flathead Lake and headed down through Missoula, where frozen yogurt in gluten-free cones really hit the spot on a sweltering day. The car has been getting pretty variable mileage as we went up and down mountains and along high desert plains, and we were still half an hour out of Butte when the fuel gauge read EMPTY, causing us to divert our trip to Anaconda. This was a mixed blessing. 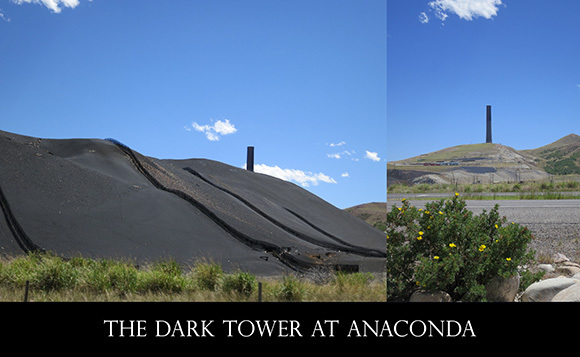 It was a little out of our way, but it allowed us to approach the forbidding dark tower that had haunted the landscape for the past hour or so. As we approached Butte we began to notice smoke in the sky. It started out as wispy and white but slowly engaged more magentas and oranges as we drove on. The orange glow we saw at the base of the smoke as we crested the Butte Pass later proved to be the 100-foot flames of the Pony fire. 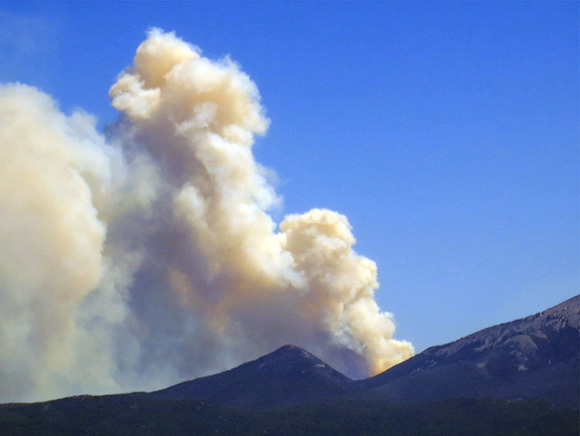 We read the next morning that it had consumed over 3000 acres the first day of the fire. The following day was spent meeting with Venetia’s mentor, Professor Michael Sexson. Michael and Lee enjoyed a stimulating conversation and some gentlemanly sportsmanship over who could name the most obscure movies, who had read the most esoteric books, and stories flowed like wine. Venetia has a lot of reading and movie watching to do to catch up and Lee has admitted he may need to watch Dead Man. After sorting through her mother’s box of pictures to take the best home and scan, Venetia’s sister called her frantically to get us out of the house to see the sunset. We went to the nearby park and climbed up a hill to get some astonishingly colorful pictures. 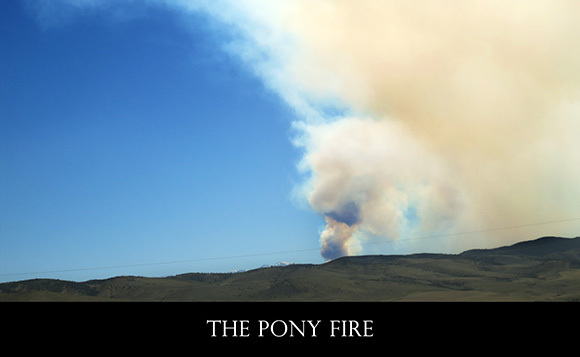 The Pony Fire may be an ongoing menace to firefighters and residents, but it surely made a beautiful sunset! The rest of the evening was spent soaking in the various pools of the Bozeman Hot Springs until closing time. We woke up early Tuesday morning to drive out to Paradise Valley, Montana where Venetia grew up. It was an odd day. 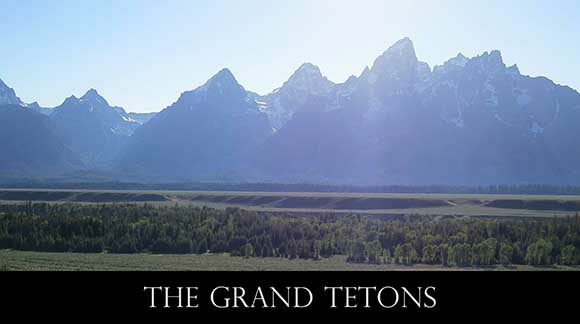 Bozeman had been windy and Venetia assured Lee that it was nothing compared to Paradise Valley. She was right of course, but even she was surprised by the 70-80 mph hours winds that day. We drove up to Pine Creek to hike up to the Pine Creek Falls and enjoyed a lovely picnic beside the waterfall. We then drove further down the valley to see the land where Venetia grew up. We use the term “land” since all that remains of the house where she grew up is the ash-filled foundation and some miscellaneous relics on the periphery of that charred foundation. We excavated for some time in the ash, fascinated by what had survived the fire. Both cast-iron pot-bellied stoves were misshapen heaps of slag but although Venetia’s mother’s china had fused into one solid piece, all the delicate painted flower designs were still clearly visible. The gnome, Lance, had lost all of his colors and most of his face but was still recognizable. And here and there about the house pages with crisp brown edges fluttered about. Note: Any day featuring 70 mph winds is a dangerous choice when shoveling ash. Venetia searched for a time for recognizable phrases from her own books but those were buried too deep as her room had been downstairs and all the surviving pages came from her father’s expose on the Iran-Contra scandal. We took some home with us to scan, as burnt pages will prove excellent reference. 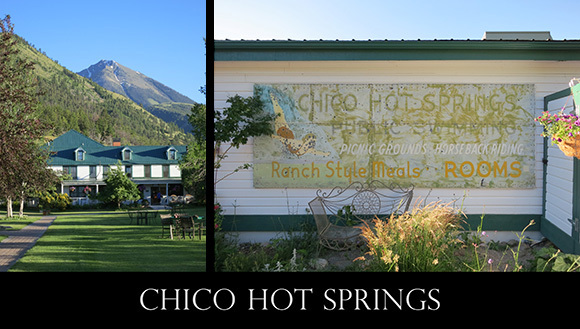 Chico Hot Springs was our final destination for the night. Our first interesting coincidence of the evening came when the younger sister of an old college friend recognized Venetia at the Wildflower Cafe. Venetia’s friend had lost his hand after it was electrocuted by an unmarked electric company power source and his sister included in her update how he was even getting back to bow-hunting through the use of a clever prosthetic. Soon after, at Chico (formerly “Chicory”), we walked through the Saloon and noticed that the muted program on the wall-mounted TV was demonstrating just such a prosthetic. A young woman missing her hand was able to shoot a modified compound bow that allowed her to loose the arrow with her teeth. Amazing. We thought the 90-degree weather might keep the hot springs from being bearable but a lovely breeze cooled the outside air making the hot water superbly enjoyable. We spent a few hours in the pool, then briefly adjourned to eat a stellar dinner of BBQ beef ravioli and orange-glazed duck (our good karma after Lee’s fancy driving saved the mother duck and her ducklings crossing the road at twilight from being squashed.) We returned to the pool where we stayed again until closing and had our second delightful coincidence of the day. Venetia spotted one of her close friends in the pool, though she was uncertain at first of whether it was truly him since he lives in Australia! The one night we spent at Chico was serendipitously the same night he had driven out to the valley from where he was vacationing. We had a lovely time talking with him and are excited to see him again this winter, or rather, we will see him when we spend summer in Australia. 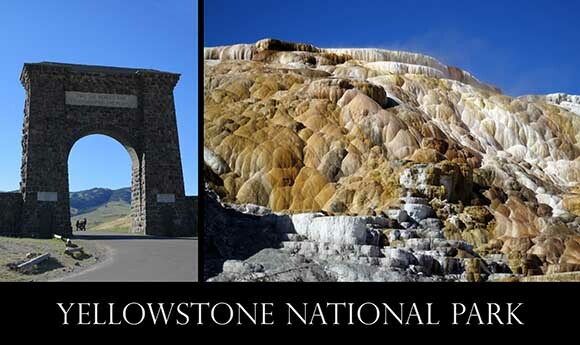 Our day in Yellowstone National Park was absolutely filled to the brim with adventure. We woke up early to avoid massive amounts of traffic but due to the fact that it was early in summer and Wednesday is an off-day for tourist, we saw surprisingly few traffic jams, only one “bear jam” and were able to find parking in every parking lot, even at Old Faithful! Mammoth was our first stop, and the place Venetia knows best since she rarely ventured further into the park. We drove up the twisty road from Gardiner to Mammoth where Venetia learned to drive and were greeted by the elk resting next to the steaming hot springs. These lovely creatures are living the dream, and their tracks appear in areas unsafe for humans. We were at first appalled by the number of hats (6 at Mammoth alone) that littered the hot springs, but then recalled the fierce winds the previous day and realized that the hats had blown off and had not been intentionally thrown in. And while we hoped the rangers would use long tongs to fish them safely out, we imagined what they’d look like if allowed to merge into the landscape. The Grand Canyon of Yellowstone was as stunning as advertised, and while the bison shown above was not surrounded by the baby bison we saw later, neither was he surrounded by ogling tourists. There were many dizzying sights to see as we drove higher and higher into the park, crossing the continental divide twice. At our highest point we were at about 8,200 feet above sea level. Quite a rise from Portland…. The colors and palettes were what had brought us so far from home, and they in no way disappointed. They were far and away the most astonishing facet of the park. 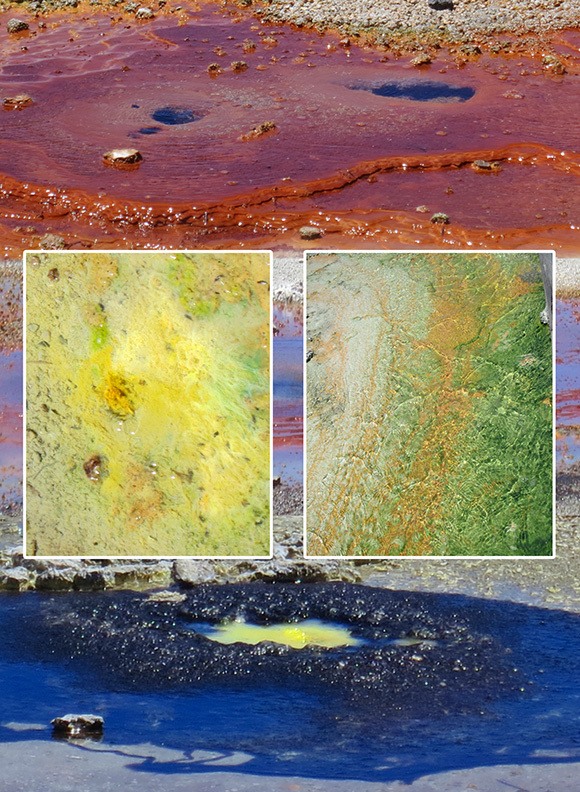 We saw what we thought might be pure sulfur due to the smell and alarming yellow hue. Having spent a few years in Glenwood Springs, the smell of sulfur that had horrified Lee when he visited as a small boy, now seemed downright homey. Of all the startling chroma, perhaps the most surprising was the river of contrasting bright orange and green that shone under crystal clear water. And the patterns and flow were as amazing that the chroma and contrast! We momentarily panicked at the thought of running out of space in our memory card, but we were looking for trouble in the wrong place. The tragedy came in running the camera down after a mere four hours of constant photography. Go figure! And where it was simple enough to buy a back-up memory card, getting a properly calibrated pre-charged battery was a non-starter (if you’ll pardon the pun). Happily the kind ranger at Old Faithful allowed us to plug in and recharge while we ate still more ice cream. And that saw us through the rest of the trip. We hadn’t planned to wait around for the Old Faithful geyser, but it kindly performed for us as we happened to pass. No waiting. We congratulated ourselves every time we pulled over to an unmarked but spectacular view, though of course we can only guess at how many natural wonders passed by unnoticed during our brief visit. 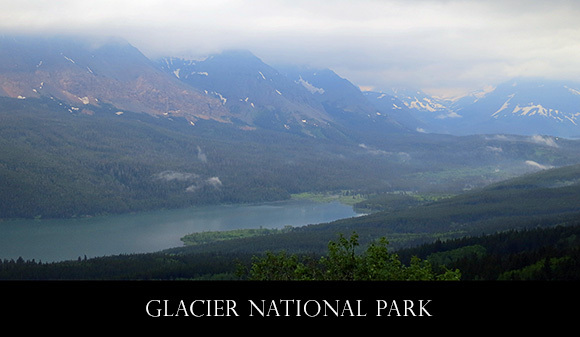 The entire park is breathtaking, and in innumerable ways! We’d love to visit the super-volcano’s caldera in the winter sometime. A few feet of snow would make it even more magical. Our trip was all about color. 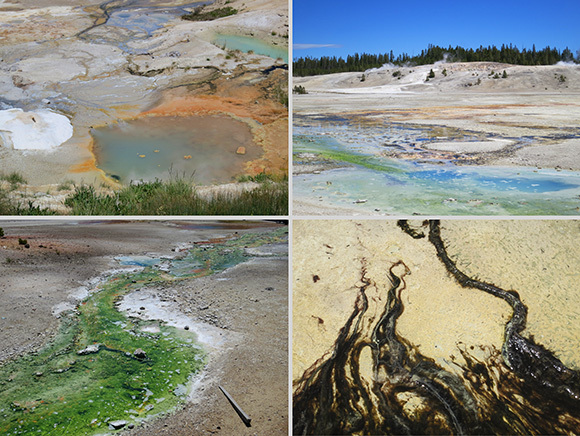 And of course it was only right that many of the hot spots we stopped at had “paint pots” in their names. These two rivulets, cheek by jowl on the slight slope, were like hot and cold running curry. The variety of colors in close proximity was as startling as the colors themselves. We drove through the park in a giant S-curve suggested to us by the park rangers after we explained our desire to focus on colors. Some of the pools of water were so blue and deep that they looked like they belonged in the Caribbean. But the idyllic dream of floating weightless in those flawlessly clear waters was always broken when we felt the heat and saw the steam (some, a reflected blue! ), and the nearby waters were so shockingly colored that none could never miss the heat and poison therein. 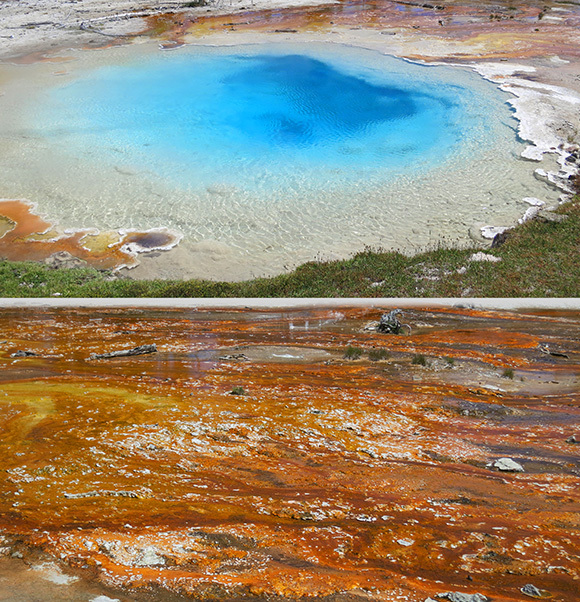 After all, the water leaping out of the ground was heated by the magma of the very core of the earth. Yikes! We made exceptionally good time through the park and headed down towards the Tetons while the sun was still high in the sky. 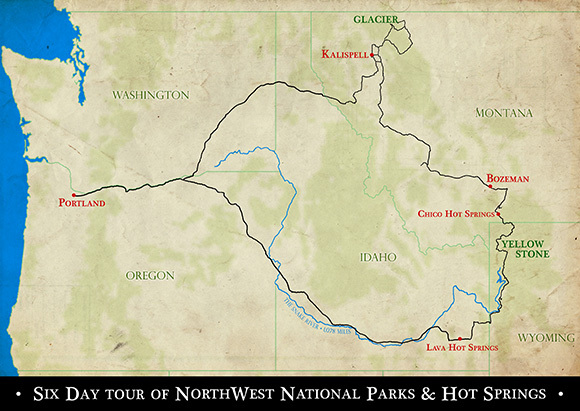 Traveling alongside the Snake River, we entered Idaho but reached Lava Hot Springs after the pool had closed. This necessitated a late start the following day as we had to spend a few solid hours in the pools at Lava Hot Springs. The hottest pool, filled with elderly Japanese and Korean ladies, was 116-degrees. We choose to spend our time in the cooler 106-degree shaded pool until our departure when Venetia submerged herself in the hotter pool just to prove a point! ‘Vacation’ is entirely the wrong word to describe the adventures we had, as it implies taking a break from life, a hint of rest, and the promise of relaxation. We are having much too much fun living to take any breaks. Every moment is filled with beauty and excitement. 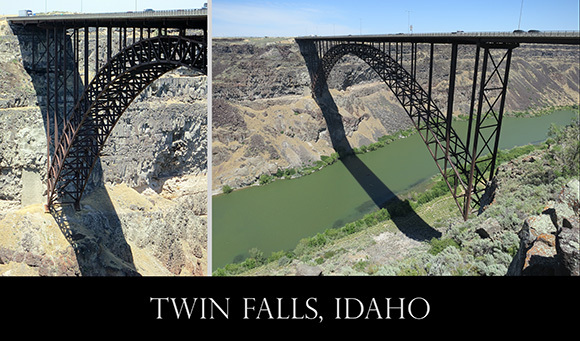 We had an awesome time traveling through the west and admiring the stunning world that we live in. We hope you like the small sampling we’ve shown you here. We’ve blathered on for quite a bit, but please feel free to ask questions, kibbitz, et al. as suits.